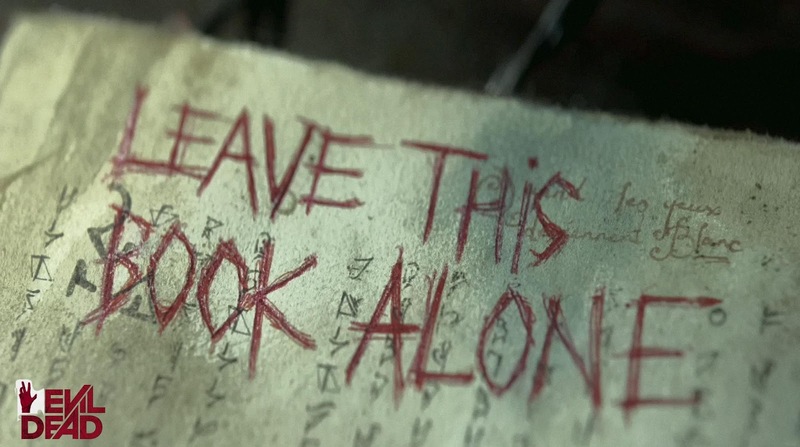 Evil Dead 2013 – You’re All Going to Die Tonight – CRITICULT – Telling you what to think since 2003. Not exactly light reading material. 5 people go to a dilapidated and foreboding cabin in the woods to help a friend, Mia (Jane Levy), detox from heroin. One of them reads from a super forbidden book, all hell literally breaks loose. Everyone clear on the plot? Great, let’s get to it. Horror is one of the trickiest genres to get right but the one non-fans think is the easiest. Anyone can throw buckets of gore on screen or have something jump out of the shadows to illicit a response. True horror comes in the dread, in the coiled tension of knowing something bad is around the corner but being unable to escape or predict it’s form. The new Evil Dead does a fantastic job using gory over the top violence to beat the audience down with one shocking sequence after another. The problem is the actual fear and tension is largely absent. The original Evil Dead (and even the more slapsticky Evil Dead 2: Dead by Dawn) had more of a stop and go pace that this new installment doesn’t. There were times in Sam Raimi’s Evil Dead where the possessed would stop being actively destructive and would just sit quietly and sing a song and giggle. These scenes were by far scarier than the moments of intense violence because you had no idea what was coming. The characters would walk around the stationary possessed like they were live cobras and as the viewer the tension was so thick it was almost unbearable to sit through. The unleashing of evil in this version is hilariously abrupt as well. Eric (Lou Taylor Pucci), a high school English teacher, takes a book the group finds in the cellar surrounded by dessicated and hanging dead cats, cuts through the barbed wire holding it closed, tears into the heavy plastic covering, and proceeds to decipher the cursed passage in about as long as it takes me to brew a cup of coffee with a Keurig. While I love that the movie spends a lot of time punishing this moron with many different implements it all seemed way too easy to releases the spirits in the first place. I did like that the movie zigs when you expected it to zag. That the scenes don’t quite go how you thought they would, that there was a little extra grisly twist to it. The makeup and special effects were truly astonishing. This movie really is not for the squeamish and you should definitely take the warnings to heart. However for the trauma these people are put through I was expecting it to look a bit more, well, painful. The mutilation is there but you don’t really see the impact. It kind of looks like what it is: actors hacking through prosthetic skin and ligaments. Gross and disturbing? Yes, but not scary. Bottom line is I liked the movie, I think it’s a good installment to the series, but I was expecting more. If you are a horror fan you have to see the new Evil Dead. Hell, you probably pre-ordered the tickets two weeks ago. For anyone on the fence it is as violent as you have heard and incredibly tense. Just don’t expect it to disturb your sleep. For all it’s violent fury the movie is much more lightweight than expected. Now, I’m going to get heavy on spoilers now so if you are a spoilerphobe steer clear. Seriously, has this guy EVER seen a horror movie?! Ok, so the whole “Collect 5 souls to release the abomination.” thing smacked way too hard of Cabin in the Woods for me. I liked that in the original movies once you read the book and unleash the spirits you are basically toast. Even when Ash stops the demons in Evil Dead 2 he still loses by getting sucked back in time. By adding the endgame to the plot it felt more like checking off cast members as they fell one by one toward a larger climax. Once we get to the ending and Mia was left to battle alone I expected the demon to put up more of a fight than just a run of the mill possessed human. I’m not even sure what the abomination was. It kind of looked like demon-Mia but they barely showed it’s face. The chainsaw death finale was great but I expected more fight from something that can lift a Jeep with one hand. More interesting to me is what they movie left out. One of the creepiest scenes in the trailer is demon-Mia peering through the trap door singing “We’re gonna get you/not another peep/time to go to sleep!” This sequence is completely absent from the final movie. The journey to the theater saw Evil Dead originally pull an NC-17 (like Raimi’s original) but ended up releasing as an R. I’m definitely curious to see what the expected unrated version will have to offer. Being a big fan of the original, I was very disappointed. I thought this was okay, but still had huge shoes to fill that it still left room for. Nice review Tyler.